The recent shooting of Missouri teenager Michael Brown has revived a national conversation about race and police brutality, about "walking while black," and about the perils of being young and not white in America. The community protests that followed have demanded much-needed nationwide soul-searching about who we are and whether those who promise to serve and protect us are fulfilling that promise with much too narrow of a scope. Because although it's Brown's name on everyone's lips, he was not the first to fall accidental victim of institutional prejudice, and without a national conversation that results in meaningful change, he will not be the last. 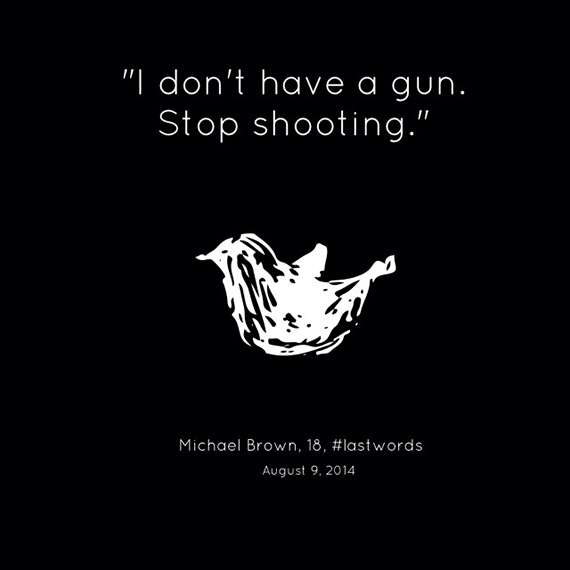 Journalist Shirin Barghi collected the last words of men like Michael Brown -- young, black, killed by authority figures while unarmed -- and turned them into powerful illustrations. "I created these images to raise awareness about racist police violence in America and as an expression of solidarity," she tweeted. "I experienced police brutality in my native Iran, and the struggle here to confront that violence resonated with me." 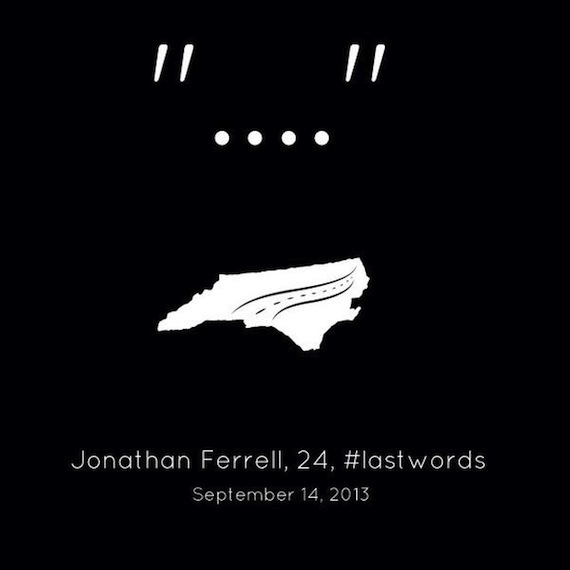 The minimalist images, eight of which appear below, are poignant echoes of the victims' final moments. Originally stopped for walking in the street, Michael Brown was shot a police officer in Ferguson, Missouri, two days before he was set to begin classes at Vatterott College. 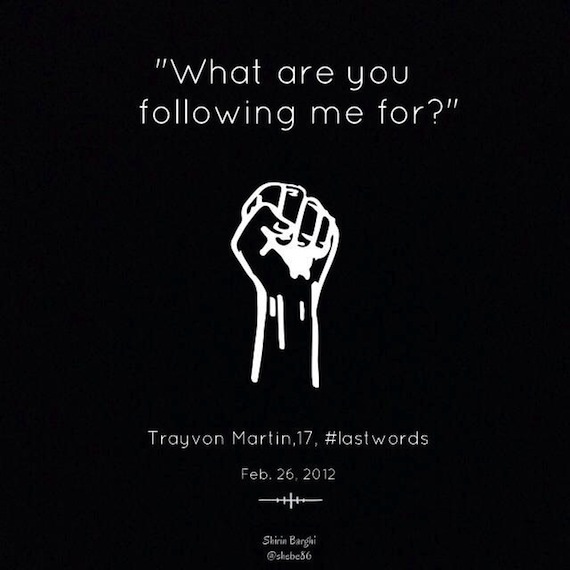 Trayvon Martin, a high school student, was killed by neighborhood watch captain George Zimmerman while walking to his father's house. 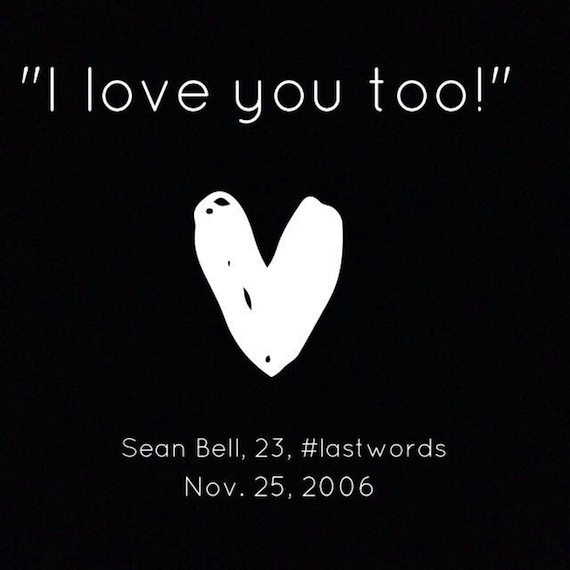 Groom-to-be Sean Bell, 23,was leaving his bachelor party when police fired 50 bullets at him. His friend, Joseph Guzman, told him that he loved him as they attempted to escape the onslaught. 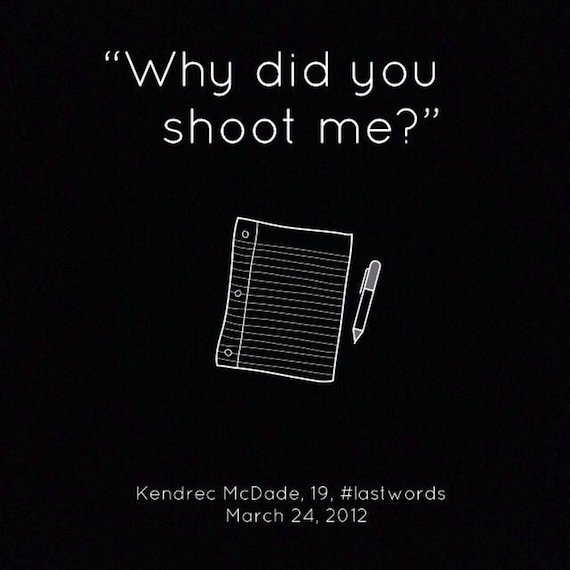 California teenager Kendrec McDade was fatally shot by police who answered a 911 call about an armed robbery. The caller said that McDade was armed in the hopes of receiving a quicker response. Former college football player Jonathan Ferrell was shot 10 times by a police officer while seeking help following a car crash a month before his 25th birthday. He didn't have time to explain. 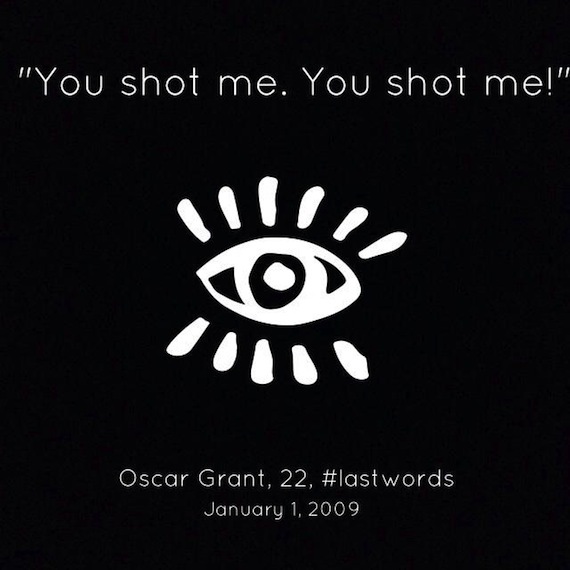 Oscar Grant, 22, was shot and killed by a police officer on New Year's Day, 2009. The officer testified that he meant to reach for his Taser but accidentally pulled out his gun. 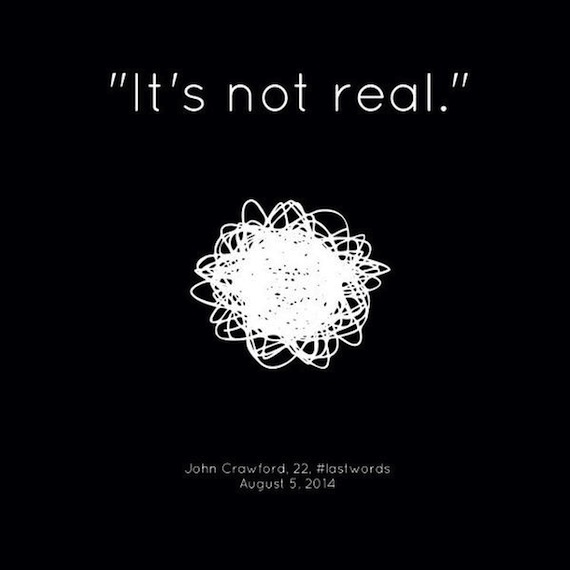 John Crawford, 22, was on the phone with his mother when he was shot by police in an Ohio Walmart. Police said he didn't follow commands to put down a pellet rifle he'd picked up in the store. 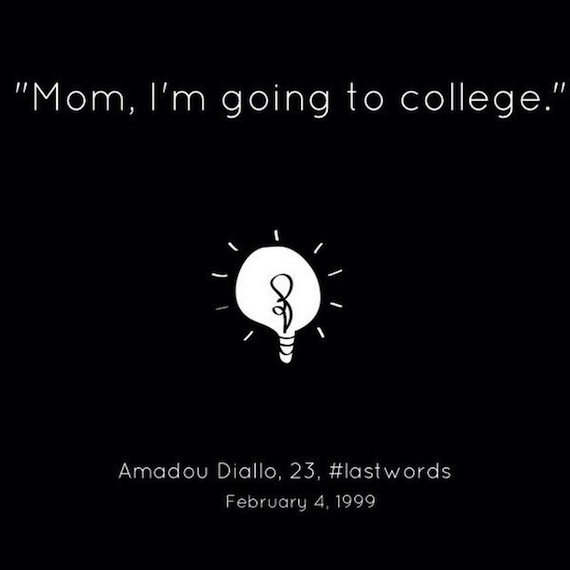 Aspiring college student Amadou Diallo was mistaken for someone else by four plainclothes officers. The last thing he told his mother was that he had saved $9,000 for college expenses.